This article first appeared in Capital, The Edge Malaysia Weekly, on April 30, 2018 - May 06, 2018. THE stage is set for the 14th general election (GE14), which will be held in less than two weeks. The towns and cities are festooned with the flags, posters and banners of the political parties while there are ceramah every night for the politicians to garner support. Much has been said about a pre-election rally on the local bourse but against a backdrop of global uncertainty, investors seem to have become risk-averse. The market is widely expected to rally if Barisan Nasional retains its federal power, whereas a victory by Pakatan Harapan could put Malaysia in uncharted territory, in which no one can conclusively say where the market will head. It could swing either way. For example, Bursa Malaysia succumbed to heavy selling when the incumbent Barisan Nasional lost its two-thirds majority in parliament in the general election in 2008, for the first time since polls in 1969. But it is worth noting that an external factor — the 2008/09 global financial crisis triggered by the US subprime meltdown — sent Bursa tumbling to an even lower level that year. Indeed, the FBM KLCI plunged 33% within 12 months of polling day. The outcome of GE14 aside, when the dust settles on the political front, there are five other variables that we believe could determine the direction of the local stock market. It cannot be denied that the movement of crude oil prices influences the local stock market. To recap, Brent crude oil was trading at an average of US$108 per barrel in 2013. This formed a strong platform for the post-GE13 rally that lasted until late October 2014, when oil prices collapsed, sinking below US$30 the year after. The FBM KLCI gained close to 10% within 12 months of polling day in 2013 but the rally on the broader market was even stronger. For example, the Bursa Malaysia Small Cap Index surged 62% within 15 months of polling day. Oil and gas stocks were well sought after as their valuations were at historical highs with hefty premiums, given the robust upstream activities at the time. On the economic front, being an oil-producing nation, Malaysia benefited from the high crude oil prices. Its coffers were replenished with oil revenue and the ringgit appreciated against other currencies. Interestingly, the inflation rate at the time was lower than that seen last year. Crude oil recently rebounded from its trough. Will its recovery help fuel another strong post-election rally, ceteris paribus? 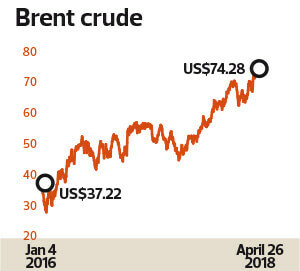 Brent crude has risen more than 40% in the last 12 months, from US$52 per barrel to US$73 per barrel as at press time, thanks to the Organization of the Petroleum Exporting Countries’ (Opec) production cut agreement signed last year. The agreement between Opec and allied non-Opec producers to cut production by 1.8 million barrels a day is set to be extended to year-end. This is expected to lend support to oil prices. It is worth noting that crude’s current price level is a far cry from the oil boom in 2013. Indeed, the oil and gas industry landscape has changed over the past three years. Many local oil and gas players are in the process of adjusting to the “new norm”, finding ways to survive in a low oil price environment that has resulted in tight cash flow and mounting debt pressure. Generally, jobs remain scarce, although upstream activity has increased of late. Simply put, the pie is smaller than before, at least for now. That said, CIMB Research is optimistic about the sector, maintaining its “overweight” call on it. The research house believes the current strength of oil prices has legs, citing the accelerating pace of OECD industry oil inventory drawdown, geopolitical risks and the production cut commitment of Opec and non-Opec members as among factors that will sustain the momentum of crude oil’s recovery. The International Energy Agency is forecasting US oil production growth to slow down by the fourth quarter of this year as pipeline capacity hit 96% utilisation recently, forcing Permian Midland shale oil producers to discount their crude selling price, according to CIMB Research. This may pose a threat to future production as producers slow drilling activity and/or slow down the completion of drilled wells, it adds. The ringgit is one of the best-performing currencies in Asia, year to date. The local currency has appreciated 11.76% against the US dollar since the start of 2018. The sharp gains show that the market has realised how undervalued the ringgit is, some quarters say. The strengthening ringgit makes local assets, be it equities or government bonds, more appealing to foreign investors. It will be double bonus for foreign investors, in the form of capital gains and foreign exchange gains, when asset prices appreciate. For Malaysians, a stable local currency will discourage capital flight. The ringgit’s newfound strength could be attributed to four factors: Bank Negara Malaysia’s shift to a more hawkish stance on the back of robust economic growth; the strengthening of crude oil and natural gas prices; a weakening US Dollar Index; and accelerated repatriation of export proceeds by Malaysian exporters on expectations of the ringgit strengthening further. According to AmInvestment Bank, there was a strong correlation between the FBM KLCI and the ringgit’s strength against the US dollar from Jan 1, 2014, to Sept 30, 2017. “The correlation between the two has broken down since October 2017 — which we strongly believe is temporary in nature. In other words, assuming the ringgit’s strength is sustainable, at least, we believe the market will eventually catch up,” says AmInvestment in its 2018 Market Outlook Strategy report. In January, Bank Negara raised its overnight policy rate (OPR) by 25 basis points to 3.25%, the first hike since July 2014. This boosted not only the ringgit but also crude oil prices. Most analysts have maintained their OPR forecast of 3.25% for 2018 and expect another hike to come only in 2019. A strong ringgit is a double-edged sword. It is a boon for domestic market-oriented companies that need to import raw materials. Companies that need to acquire new equipment and machinery for automation or capacity expansion will also benefit. However, it is a bane for export-oriented companies as any strengthening of the exchange rate would translate into lower converted export revenue. The continued strengthening of the ringgit would even result in forex losses among export-oriented companies, including plastic packaging players, furniture makers and semiconductor manufacturers. In fact, some companies had already felt the impact in the first quarter of the year. On the economic front, a strong ringgit will help contain inflationary pressures caused by costlier imported items. Subsequently, the pain of the rising cost of living will ease as people’s purchasing power improves with a firmer ringgit in hand. Bank Negara has raised its GDP growth forecast for this year to between 5.5% and 6%, up from between 5% and 5.5% previously. Theoretically, robust economic growth should translate into a stronger local currency. 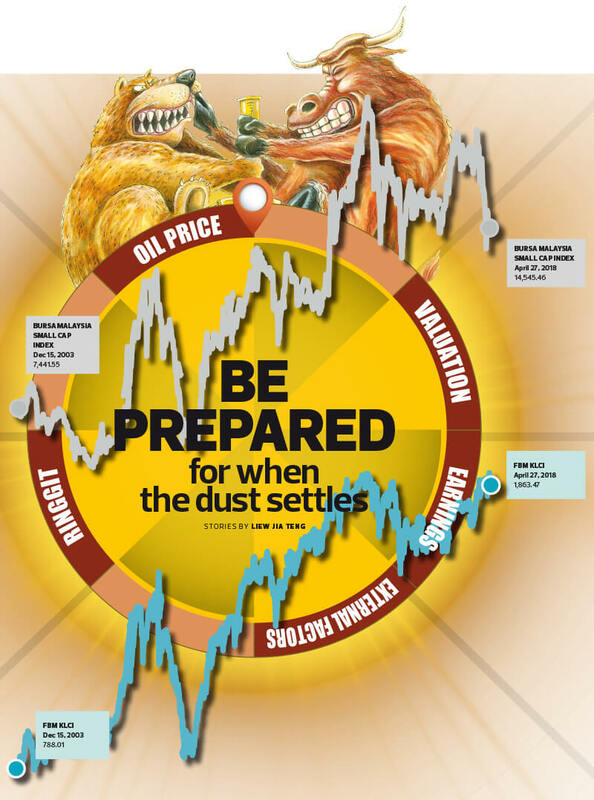 Global events could take centre stage, dictating the direction of equity prices on Bursa. Trade wars, geopolitical tensions and the global interest rate trend, particularly in the US, are external uncertainties. Trade tensions between the US and China have unnerved many. They have prodded the equity bears and sparked a round of heavy selldown in the past two months. A full-fledged trade war would have severe repercussions for the global economy. International Monetary Fund managing director Christine Lagarde had recently warned that the biggest danger from the US-China trade dispute is the threat to global confidence and investment. “The actual impact on growth is not substantial when you measure in terms of GDP. (But) when investors do not know under what terms they will be trading, when they don’t know how to organise their supply chain, they become reluctant to invest,” Lagarde explained. Being an open economy, Malaysia is likely to be affected, especially its export-oriented manufacturing sector. Mounting geopolitical tensions in the US, Syria and North Korea also continue to cast a shadow on the stock markets. Over a week ago, the US, France and Britain launched missiles targeting what the Pentagon said were three chemical weapon facilities in Syria, in retaliation for a suspected poison gas attack on Douma in early April. Over in North Korea, Pyongyang said it no longer needed nuclear or intercontinental ballistic missile tests because it had reached its weapon development goals. That said, probably only supreme leader Kim Jong Un knows whether he has shut down his nuclear programme. Meanwhile, economies around the world, including Malaysia’s, are moving out of a decade-long low interest rate environment, which had stemmed from the US subprime mortgage crisis in 2008/09. Should central banks raise interest rates faster and more aggressively than anticipated, it is unlikely to go down well with the stock markets. Interest rate hikes would affect the direction of investment money flow. Besides, the impact of the end of a low interest rate era on equities and the global economy is still an unknown to the experts. The pressure of interest expenses on consumers, business entrepreneurs and countries’ fiscals should probably not be overlooked. Corporate earnings in 2017 were not considered impressive, given that the domestic economy grew at a fast clip of 5.9% — one of the highest in Asia. Moving forward, analysts are less upbeat on earnings growth forecasts, considering the uncertainties on the horizon. Investors will probably start paying more attention to the core profits of companies, excluding one-off extraordinary items, as the exchange rate of the ringgit against other major currencies normalises. Based on Bloomberg data, the earnings of 447 of the 877 companies listed on Bursa improved in 2017, while those of the other half deteriorated. Some of the 447 charted profit growth in their 12-month earnings due mainly to changes in other comprehensive income, for example a reversal of provisions earlier recognised as well as foreign exchange translation differences. Others saw a pick-up in business as reflected in the growth in their revenue and better earnings as a result of cost-optimisation measures. “Our economic fundamentals remain robust and the global economy remains on a growth trajectory. Corporate earnings growth is expected to be 9%, underpinned by a stronger banking sector, which is a good proxy for the economy. Moreover, we see accommodative interest rates as well as improving consumer sentiment and liquidity in the banking industry,” says Kenny Yee, head of research at Rakuten Trade Sdn Bhd. Mohd Redza Abdul Rahman, head of research at MIDF Research, comments that corporate earnings growth is expected to moderate at 4.39% for FBM KLCI constituents and about 3.4% for the 117 stocks in the research house’s universe. “After a good performance last year, the higher base and the appreciation of the ringgit will result in lower corporate earnings growth this year,” he says. The bottom lines of export-oriented companies boosted by foreign exchange gains on a weak ringgit are likely to feel the high-base effect. But it could be the reverse should the ringgit strengthen. Manufacturers, whether in the semiconductor, furniture or glove industries, will have to deliver growth in core profits. Sales volume, profit margin and cost efficiency are likely to be closely watched, given that the market has a high expectation of earnings growth. Meanwhile, it would be interesting to see if the massive impairment on asset value among the oil and gas companies is at the tail end of the cycle. The steady climb in crude oil prices has lifted optimism about the sector with some investment analysts already starting to recommend oil and gas counters. Still, the recovery might not be across the board, analysts say, as healthy balance sheets are crucial at the moment to keep these companies afloat when jobs are still limited. The property sector is expected to spring a pleasant surprise as it is pretty much a buyer’s market. Global equity markets delivered good returns last year, driven by strong economic growth in both developed and emerging markets. Many stock markets have reached their record highs, raising the question of whether corporate earnings are strong enough to justify such expensive valuations. In fact, the US Federal Reserve had warned in February that the valuation of stocks on Wall Street was getting too high. According to the Fed’s Monetary Policy Report to Congress, in the second half of 2017, valuation pressures edged up from already elevated levels. It noted that the price-earnings ratios (PERs) of US stocks were “close to their highest levels outside the 1990s”. Trading at a PER of 16 times, the Malaysian market is not particularly cheap. Using historical PERs as the yardstick, the FBM KLCI is trading slightly above its five-year average of about 17.2 times. As for the small and mid caps, they remain pricey relative to an average historical PER despite the intensive selldown earlier this year. 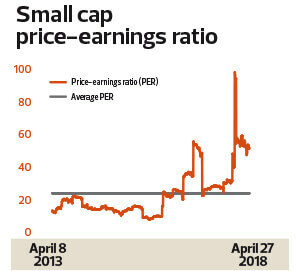 The Bursa Malaysia Small Cap Index is trading at a PER of slightly more than 50 times, compared with the five-year average of 24 times. Earnings will have to catch up to sustain the current share price level of companies, not to mention for the prices to climb. Share price valuation could be seen as an equation of many variables, including economic fundamentals, earnings prospects, industry landscape, management quality and business risks. Other factors that determine premium or discount pricing include market sentiment or even herd instinct. Perhaps a pertinent question is, when the ample liquidity in the financial markets in the past decade starts to evaporate, how will that affect the current expensive valuations of equities? Valuations are also expected to moderate as the risk-on mode creeps in from external factors such as interest rate hikes and higher commodity prices, but this will be moderated by the expected compromise in the US-China trade war, says Mohd Redza Abdul Rahman, head of research at MIDF Research. “Stock valuations are relatively cheap, particularly for the beat-up stocks, including small caps, but investors need to look closely at earnings visibility going forward before acting. Counters such as property and telecoms have seen price declines but at the same time, they are good dividend picks,” he adds. Market experts have repeatedly warned that global markets are trading at very high valuations. The potential risk of this has been overlooked, or even ignored, by investors. While 2017 was a good year in terms of stock market performance, investors are advised to be more cautious this year by shifting into defensive mode.